I've been a resident of Bennett, Colorado for more than twenty years; born and raise and I'm no stranger to the ghost stories here in this town. 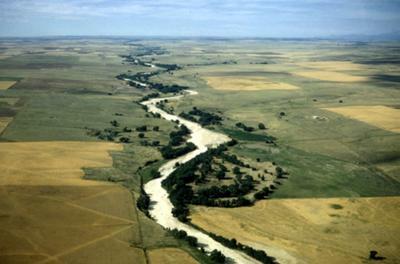 In the late 1800's (I'm not sure of the year due to the different residents and their own stories) the Kiowa creek is know to flood from time to time alone with sand sink holes, but as in recent years rain was in short supply. But the story is that a freight train driven by engineer Mr. Bennett was running a late shipment and as the train was passing over the bridge, a flash flood hit the brigde and swept the engine, coal, and a few freight cars were taken down stream. With the engine having disappered the town in honor of Mr. Bennett named the town after him. As for the haunting in the creek many others as well as myself have experienced different strange incidecents. Such as a ghost train speeding by around the time of 3:40 PM, I have not seen this myself. But as for my own experiences; my friend Cody and I went to the train brigde five minutes before the said time, we had a new digital camra and taken ten different photos. Later on reviewing the photos there was a white dot in the corner of these photos each one having a new location on the pictures. Another time another friend of mine Jesse and I went to the creek but before actually getting to the creek we thought that a farmer was coming down the road, so we hid behind farm equipment and as we waited for a farmer who wasn't there I heard a noise from the train tracks above us I turned gesturing Jesse to also investagate. We both saw what looked like a "Hell hound" or a very large dog with red eyes upon the tracks peering down on us and then running the distant of the tracks to the brigde. I do not know what if at all why a "Hell hound" was doing at this location; it to this day has puzzled me the only other explaination could be the cemetry down the road, but even then I dont know why it be on the tracks. As for the last time I was down there it was with both Cody and Jesse; I being the smart person I am (definatly not) wanted to walk across the bridge at the time when the ghost train comes through. Cody and Jesse voted not to and as for me, youthful foolishness kicked in, I then proceed to walk across the tracks and as I did I heard voices and me thinking the other two wanted me to come back turned around and yelled back for them to speak up do to the wind. They said nothing so I continued on and about half way across the tracks the voices came back even louder this time and it seemed as if they were coming from the creek itself. I then worried about a true to life train coming across the tracks so i decided to turn around and go back. As I went back the voices got quieter and quieter. When I got back to the two on the other side I asked what they wanted. They said that they didn't say a word to me they just lit up a smoke. As before I'm not sure what was up it may have been the wind playing tricks on my mind, I dont know but as for the haunted Kiowa creek brigde I believe that theres something there. I've given you my testamonial so you can make your own desision about Bennett. Hello. I to am from Bennett grew up there and am relatives to the family that owns that section of the creek. Yes I agree that it is definatly haunted. I captured a picture under the 36 bridge of a full bodied aporition that I annalized as someone that had hung themselves there. as to the truth to this I have come up empty handed with all the research that I have done. I have had too many unexplained experiences there to even start telling of them. it is never dull when I go there something always happens and I have never come home empty handed as far as evidence goes. Your history is partially correct the town its self was actually named Kiowa before Bennett it was renamed to honor the conductors of the train that perished, they had married sisters with the last name of Bennett so in their honor the town was renamed. as far as the cemetery goes that is one place I can not wait to go investigate. as the lead investigator of Earthly Paranormal Research Team out of Brighton I am excited to go investigate it. I have never been on the train bridge at 3;40pm however thank you for the tip I will have to give that a shot and see what happens to me I have never been one to get scared of things easily. I grew up about 5 or so miles from third bridge and my parents were Bennett fire fighters and were at the wreck that was fatal there in 97.